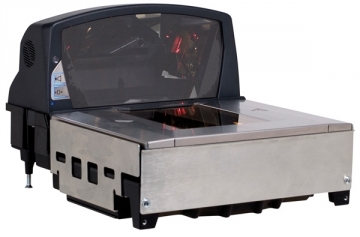 The Stratos 2400 from Honeywell is a high-quality, 5-sided, bi-optic, in-counter scanner for every POS environment, configured for especially high throughput with comfortable handling. The patented scan modules are independent and guarantee high reliability. Moreover, the modular design makes installation easy, keeps you maintenance costs down and ensures long-term successful operation for many years. The Stratos 2400 is the newest model of the Stratos family with bi-optic 360 in-counter scanning. It decodes all common 1D and GS1 DataBar codes especially quickly and intelligently at up to 5,400 scan lines per second. Honeywell has enhanced the StratosSPHERE decoder software in order to provide you improved productivity at the POS station. This improves capture rates and enhances the check-out process, as this is conducted straight away without having to position the bar code. You can get the StratosH with and without an integrated scale in order to flexibly react to you future needs and various kinds of requirements. The 2400 features a fast microprocessor, expanded decoding software and an optimised vertical scan module. Moreover, with the help of the two analysis tools StratosSTATS and StratosSCHOOL, productivity can be better measured, managed and optimised. StratoSTATS allows for statistical evaluation of scan data, in order to immediately identify poorly readable bar codes. StratosSCHOOL also collects information on the scanning behaviour of check-out personnel to be able to make their scanning techniques more ergonomic and effective through training. Using the intelligent StratosSWAP, the StratosH is designed so that wear parts can be replaced as modules on site within minutes. Using only one mouse click, maintenance intervals can be requested and firmware or configuration updates conducted from the central PC. This ensures the customer that all workstations are actually configured with the same settings, avoiding troubleshooting.